Jim Macdonald and I will be on a road trip down to Peterborough, NH, where we’ll be part of the group book-signing for the Conspiracy! anthology at the Toadstool Bookshop. Our audiobook for the drive down and back is The Count of Monte Cristo. Nineteenth-century doorstop novels make great road books, especially if you stick to the blood-and-thunder end of the spectrum. We’ve already gone through Wilkie Collins’s The Moonstone and The Woman in White, both of which I can heartily recommend – among other things, Collins has a lot fewer female characters whom I want to slap silly than, say, Dickens does. I don’t think we’ll be trying anything by Hardy, or by Henry James, though; the blind malice of the universe and the delicate delineation of interior states aren’t exactly the best antidotes for highway hypnosis. Next up, after we’re done with Edmond Dantès and the gang, will be a handful of Welcome to Night Vale podcasts. After that . . . who knows? Maybe The Three Musketeers. Because it is now, at least in theory, spring (the thermometer got down to 10°F last night, so what it is in practice is something else again), it’s time once more for a Seasonal Special Offer. From now through the 15th of April, in hope of warmer and brighter days to come, my usual rate for a full line-edit and critique for a standard-weight novel drops back to $1000. Furthermore, you can purchase a gift certificate for a friend or colleague at the seasonal price, to be redeemed by the recipient at whatever future date they find convenient. 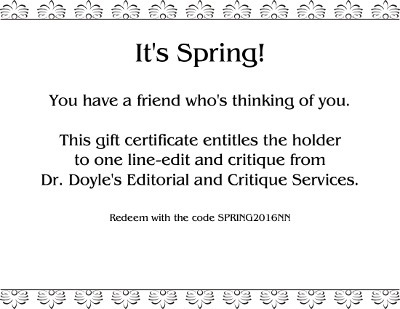 Needless to say – but I’ll say it anyway – you can also take advantage of this seasonal offer to pre-purchase a line-edit and critique for yourself on the same terms. Also, for your amusement: How to make a gingerbread TARDIS.